As usual, reviewing music by friends of yours is not always easy, even more so when you have also played with them - and with Matteo Uggeri/Hue I have shared a release I'm very fond of. But well. I think this is the first full-length release where Hue doesn't use his usual alias Sparkle in Grey, which makes sense: while SiG is an electronic-based project (be it IDM, ambient or electroacoustics), this disc (the title means "A summer without rain") is mainly based on concrete recordings, found sounds and real time performances, courtesy of a bunch of friends (Davide Vallecchi/aal, Andrea Marutti/Amon-Never Know, Giuseppe Verticchio/Nimh, Nefelheim...). The whole thing started in 2003, when during his summer holidays Hue picked up every kind of sound with a minidisc (voices, cicadas, church chants, pebbles, rain...) and played with the above mentioned mates; one year later, he met Davide Vallecchi again and added more field recordings and guitars. Everything was eventually assembled in seven tracks, clocking in at one hour, featuring several sub-divisions or movements. Despite the following work of editing and mixing, which must have been very careful, the whole work has maintained a free-flowing, fragmentary feel. You can hear Hue talking with other people, or walking, or jamming - a kind of diary or polaroid collection. The strictly musical part is quite limited, with a predominance of Vallecchi's melancholic guitars, which have a sort of wave feel to them, perfectly merging with the atmosphere of the cd. Which is one of nostalgic recollection, of letting yourself go or just flow with the environment (sounds a little summer-of-love, doesn't it). It's a work with many details and shades which will appeal to those who like the more humane part of field-recordings based compositions. Due to its very fragmentary nature, it honestly fails to really grasp my attention after its first half or so, but I'm a very tired listener at the moment. I'm sure some more spinning would do this justice. 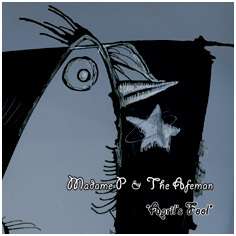 Great layout and weird collaboration for this 3"mcd which puts back on the map both Andrea Marutti (head chief of Afe records, but also musician mainly known as Amon/Never Known) and Madame P. I think unusual it's the only comment that really make sense given that Marutti is quite far from his usual ambient-dronical-electronic environment and Madame P is not singing and that's been her usual occupation so far. Despite the title "April's fool" sounds much more cold and serious than you could expect from such a layout. Let's say this' an electroacoustic/concrete-electronic release where synths and laptop dissimulate the natural noises made out of contact microphones, glass and objects. A short collection of four episodes of playful improvisation reworked and redefined by the hand of both. The end result is sometimes sharp and simple, an audio blast like some primitive electronic-industrial experimentalists in the way it was back in the early eighties. Fans are warned it's a limited edition, non-aficionados should keep in mind the average material of these two musicians is really different. I had never heard of this band, but the name is clever. The first thing you notice is the DIY artwork, but the best part about the artwork is the defaced Chick tract about Masonry. I especially liked the way they replaced the Baphomet sigil with the McDonalds golden arches and added Mickey Mouse ears to the hat. On to the music. Because the sides are not labeled, I’ll just call them "Male" and "Female" because of the pictures on the album but the tracks are called "Mind Control" and "Going Down." The Male side begins with a slow scraping sound that goes throughout the piece. There is a repetitive melody/theme that goes through the music. Toward the end, there is feedback that becomes increasingly more intense, then suddenly stops. It is oddly soothing. The Female side features processed samples of what sounds like a talk radio show blended with a piano theme and random crackling and tapping that takes place just beneath the surface. The track suddenly switches gears to thudding beats and slightly distorted music. I wouldn’t call it noise – more like lo-fi. Slows down and suddenly stops. I don’t quite know what to make of this album. It was fine to listen to, and enjoyable, but not something that will spend a lot of time on my turntablenot because of any problems with the music, but a matter of taste. I’m reminded Abraham Lincoln’s statement, "For those who like this sort of thing, this is the sort of thing they like." But this is something to take a chance on if you’re looking for something that doesn’t fit into a specific mold. Philip Jeck's more "melodic" stuff. Truly an exquisite record with a nice foggy mitteleuropean artwork. Stefan Rukavina aka BLEIBURG returns earlier than expected with a new full-length album, just 5 months after his DCD "History In Flames" in collaboration with MAN-MACHINE, both out on the German special mail order service SkullLine. After the widely thrown in diversity which that DCD had to offer, this new album differs. Although the artwork presents a soldiers’ graveyard, it isn’t at all a release inspired by trendy Electro/harsh EBM styles. With his partner E. W. Schröder, who integrates some deep male vocals here and there, Stefan offers dark experimental electronic music somewhere based on Electronica, dark Ambient textures up to Ritual Industrial. The whole concept offers a very cinematic, at times futuristic background, rhythms or danceable tunes are mostly left out. Some rotations under a pair of headphones with fully attention should help to grab the content behind this work. Slow and creepy layering stuff, which should appeal you. As usual for SkullLine releases, also this item will be rather limited, this time to 150 numbered pieces and it is packed in a DVD box featuring 4 remarkable goodies (1 pin, 2 photos, 1 wired crucifix) as well. A hard-to-get collector's item and ONLY available at SkullLine.